A TV comedian undertook work experience at his hometown newspaper’s offices this week while filming the new series of his show. 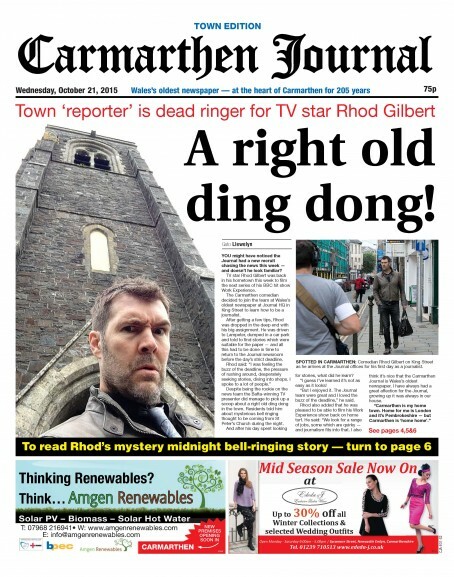 Rhod Gilbert, who is best known for formerly presenting music quiz Never Mind the Buzzcocks, has spent time completing the duties of a trainee reporter at the Carmarthen Journal this week, which will form the basis of an episode of his BBC programme ‘Rhod Gilbert’s Work Experience’. The series sees him spend time doing various jobs, which in the past have included hairdresser, binman and soldier. Rhod’s appearance in the office provided a splash for this week’s edition of the Journal, pictured below, which was released yesterday. His time there saw him despatched to Lampeter and told to find stories in time for deadline. He returned with a tale about a mysterious bell ringing in the town. The episode is set to air on BBC1 in the New Year. Editor Emma Bryant said: “It was great to have Rhod filming – and working – with us. He managed to get some great stories for the paper and it will be great to see his byline on the page. Rhod was the second famous face to pay a visit to the Journal in a week, after staff welcomed Welsh First Minister Carwyn Jones to its office. Emma and her reporters quizzed Mr Jones over issues such as milk prices, the Swansea Bay city region and the future of the Welsh language in Carmarthen. Emma thought it was all extremely great. I’ve never heard of him. Is he famous? Sorry, ex-JP, unless you are joking, you must have led a very sheltered life. Try Google.